I have mixed feelings about New Year's resolutions. I mean on the one hand they can be great, but more often then not they are lofty and unattainable and you forget about them by January 15th. So how does one go about making resolutions that are going to stick. And saying you aren't making any resolutions for the year is in fact making a resolution so that does not count. I have done many goal setting activities in the past and they all tell you to make goals that are attainable (well if you work at them all goals are attainable generally) make goals specific (losing weight can be specific) make them measurable (starting out at day one of 2017 and where you end up at day 365 of 2017 is measurable) relevant (why would you make a goal that didn't relate to you??) and time sensitive (a year is a time frame), so even those lofty I'm going to eat better for 2017 goals could fit into the SMART acronym of goal setting. Months ago I posted about The Bra Lounge. The only place in town I could find bras to fit the sisters into. When you are a 36 H buying at The Bay is never an option!! So I was able to find two new bras from the Bra Lounge even though I was going in for surgery in two or so months. Then they had this post on twitter a call for models, women of every size who loved their body just the way it was so I immediately volunteered. See when I was younger I always wanted to be a model or an actress, but I never really knew how to get past my insecurities to go out an pursue this venture. So then modelling became a bucket list item. And I know I could model my own products and stuff but what fun is that I wanted to do an event, something that either for a magazine or an event. Now I didn't know if they'd call me back, because maybe I didn't fit their idea for a model, but I was willing to put myself out there. And in the end, out there is where I put myself. 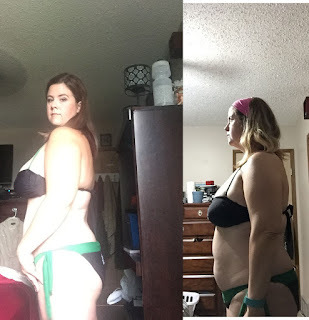 In July I decided I needed to take control of my health and fitness. I've said this in the past but many times things come up and I put it aside, so in July I was keen I was going to do this part of it was because of my upcoming surgery (more about that in another blog) and part because it's the healthy choice. I think I may have even posted a blog about it in August or something you can read the link there. And I've stayed pretty true to everything. I really started out weighing 100 kg, or 220 pounds. And though I could have had more amazing results I have had some incredible results with a little fluctuation. I made it down to 215 lbs easily and I hovered in that area for at least 6 weeks, maybe losing a pound or two only to gain it back. I am the worst blogger, so if you come here from time to time and read my posts THANK YOU!! I really should have known I'd be a terrible blogger, I mean I am a terribly diary/ journal keeper, but I do have like 16 of them around my house. I have been really good in other areas of my life, I've been budgeting well, I've been writing other things and finished my first novel on Wattpad, check out the link if you'd like. I've also been very focused on my career and I am LOVING my job so there is not always a lot to talk about. I'm going to try getting into this blogging again, and hopefully this time it sticks.... but if not then hey I'm giving it a try, one year it will stick and it will be AMAZING!! So here we are at it trying to give this a go! !